Scottish Claddagh Engagement Ring : LOVE2HAVE in the UK! 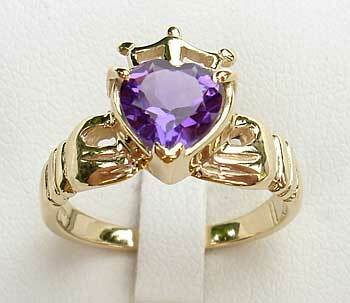 A 9ct gold, Amethyst heart Claddagh engagement ring made in Scotland that is approximately 11mm wide at its widest point. The faceted amethyst measures 7mm. 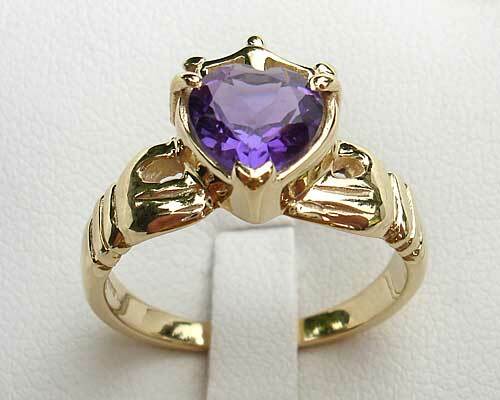 The heart symbol of love for this Claddagh ring is an amethyst stone with the hands of friendship surrounding it made from gold along with the loyalty crown also. An unusual design but still very traditional that first appeared in the 17th century in Ireland. Other stones are available too - Iolite, Peridot, Citrine, BlueTopaz and Garnet. Please email us for details. Also available in silver and 9ct white or rose gold. We took the picture below from a more on top angle showing the crown styling. Width(s) Available: 11mm at the widest point. Metal(s)/Material(s) Available: 9ct yellow gold, 9ct white gold, 9ct rose gold, 925 sterling silver. Returns Policy: You may return this Scottish made Celtic engagement ring if it is not to your satisfaction as long as it is not engraved. Please see our terms and conditions.